Thanks. I like the Bonanza, too...but I get 90% of the performance with 50% of the operating cost. The short body Mooneys are really just 2 seaters with LOTS of baggage anyway! Absolutely. My old man has a Bonanza, and it has been a pretty solid money pit for him, though I guess in his retirement he has very little else to worry about I've not flown a Mooney before, but I wouldn't imagine that it would be a very different experience.....both seem relatively slick and responsive to me. As long as you're not trying to fit in the back seat! Well, at least with the "short body" Mooneys. What's great about a Mooney is that, in the Certified 4 place 180 hp range there is really nothing that can out climb and out run it. It's nice to only have to feed/maintain a 4 cylinder 180 horse engine. Burn is +/- 9.5/hr and cruise is around 160 ktas. Mine does have some clean up/speed mods, but not all of them. I also have the manual gear, so it's quite reliable and requires little maintenance...just gotta keep the floor clean! I also have a non-AD prop hub, so it's a relatively low cost airplane to operate/maintain (as far as complex aircraft goes). What's nice about a Bonanza is that, even though it burns a lot of fuel (comparatively speaking) it is just an absolute hot rod that has 4 REAL seats. Don't get me wrong, they are far from the be all/end all airplane; but for my purpose it's perfect. Not a crank, it's a series of linkages and a "Johnson bar". It's the electric gear Mooneys that have a crank backup...but it's like 40 revolutions or something crazy like that. The manual gear Mooneys can raise/lower their gear in under 2 seconds, and there is no question as to whether the gear is down or not. LOL on him being so protective. Not that it's bad, but it's just funny. The Mooney surprised me with it climb performance, but coming from the AA-1 - anything would. Just saw the thread. I am a current student (part 61) with his check-ride with in reach. Been flying a 152 (1978) the past year or so. Then on to get my instrument rating. Well I just found this thread myself. PPSEL since 1993. Built my own RV6 during 4.5 years, and @ 13,000 rivets later 1st Flight was 11/7/99. There was little more than factory built spars back then, nothing like the quick builds they have today. As well the firewall forward and avionics plug and play great strides offered by so many companies now. Logged @ 100 hours in Traumahawks, 152 and 172's ... I Did 2 hours in a J3 cub for a tailwheel endorsement. If you are wondering the sickening slow J3 did little to prepare for my hot lil top gun on my field ( in its day). Logged @ 300 hours it it over a decade and sold it Sept 2010 to a flight test engineer at Embraer in Brazil. Bought the Mercedes as a going away pacifier (sold the Porsche 944 N/A what a dog compared to the Kompressor!!! )and banked the rest to help fund the next 8 years of non stop college for 2 sons. Lots of good RV stories, but no military and the only kerosene burning big tales were a few business trips I did get to TO, fly in IMC and land while logging right seat PIC in a corporate Pilatus PC12 as the Corp pilot was a CFI for the CEO in same. Of course it flew like a 747 kinda slow responding. To me all trim and heavy yoked, but then again 3/4 of my time was in a 200 mph hot rod that 1/2 inch of joy stick movement to the left and a little back pressure for a nice slow aileron roll. Quite the view inverted out the big canopy. More Pic to come...kudos if you recognize it's tail art. Last edited by NYFlapjack2; 03-28-2014 at 10:39 PM. Man I love that "Viper" paint job!! 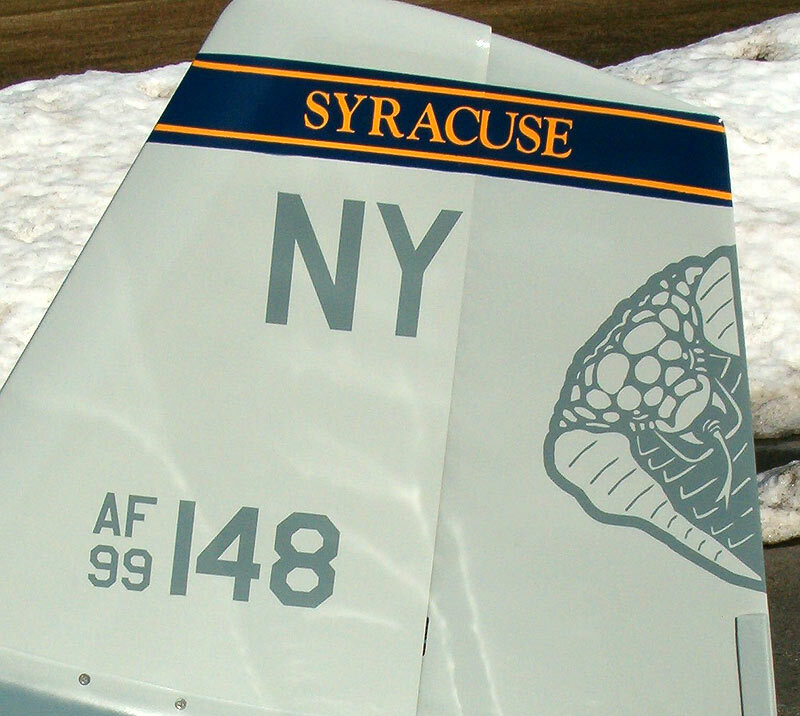 I hope you showed it to the "Boys of Syracuse", it rivals their now gone F-16s. Nice job! 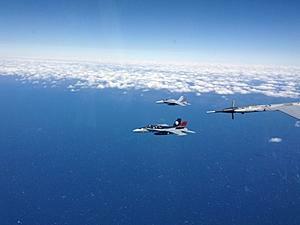 FLYNAVY, those are some nice pics!! Are you a Navy or Marine guy? I thought most Navy Hornets were single seat. The Hornet is a very capable fighter, my first fight against a Hornet was eye popping. I was doing 6gs at 450KIAS across the circle feeling pretty offensive when all of a sudden this guy points at me from all the way across the circle. After he gunned the crap out of me we reset for another 1 V 1. I quickly got some advice from my F-16 flight lead over the radio and went into the second flight with a much better game plan. That AOA capability is something else. I did get my revenge and was looking to get some more when the Hornet bingo-ed out. Fighting Hornets is a blast, but you are not kidding, you need longer legs, two looks and you're out of gas!! Best of luck in your fighter career. Every flight, no matter what, go upside down at least once. There will be a day when that is no longer an option!! 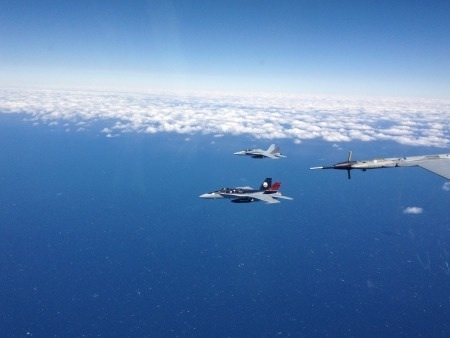 I'm a Navy guy, and those pics are from some early flights a friend and I (flying the other jet) did while in the Marine RAG in Miramar. You are correct though, all Navy legacy Hornets are single seat A+ or C, RAG jets notwithstanding. I currently fly single seat Charlies. No kidding. Big Mac Air could have really done us a favor if they had given us more internal fuel. That being said, I'd love to have a ride in a Viper.....gotta be one of the all time coolest fighters around. Wanna trade? Thanks, and trust me, I will. I don't think flying gets any better than this, though of course the pay certainly does! Last edited by 2EASy; 02-14-2012 at 07:37 AM. Hello everyone. Just saw this section and thought I'd chime in. I always wanted to fly jets. Invested a lot of time and money into Microsoft Flight Simulator. Right now, I am in the Air Force ROTC. Went through MEPS physical and found out I am color deficient. Not sure if there are many USAF pilots here, but I'd figure I'd ask anyhow. Is it possible to fly for the USAF with some color deficiency? I cannot pass the Ishigara plates, can name maybe 7 out of 14 damned plates. I did pass the FALANT which seems like a much more practical test as I highly doubt I will have to look for numbers in the sea of colored dots while I am in the cockpit, but hey, I don't make the rules. I have never had problems naming colors. I know green from red. Other than this issue, I passed the physical. I have a really good hearing, perfect blood pressure, etc. My wish is to fly C-17s or even C-5s and then eventually retire and fly for FedEx or UPS. Thanks in advance for any information! Last edited by 06E5004ME; 05-23-2012 at 10:39 PM. I'm a low time commercial pilot, I've been chugging my way up the time chart slowly since 2005. Been flying a Pa34/161T for a 135 operation for about 2 years now. Every now and then I get a taste of the Turbine world in a Be9l. Currently I've been putting applications in at any place that will give a low time guy (750TT) a chance at some stick time. Sadly those places are like finding a needle in a hay stack. I'm a police officer and am what's called a tactical flight officer. Like military pilots law enforcement pilots aren't required by law to have their license which I don't. Our main duties are; search and rescue, felony arrests, medical rescues, and so forth. As a tactical flight officer I have to first be a fully sworn law enforcement officer as we are all armed and have to be ready to jump off the helicopter at a moment's notice to make arrests or stop a shooting. I work the radios, spot lights, IR camera's and so forth. The last big mission we went on was for the Oak Creek, WI Sikh shooting. I'm currently going for my PPL but been flying since I was a kid. A family full of aviators has planted the seed very deep! I fly the V35 from a field north of Fort Worth and travel from coast to coast almost every week. The V35 is my primary commuter vehicle. If anyone is north of Fort Worth and needs a cup of coffee stop on in and land! Welcome to the boards. Say hi if you ever fly through Longview's (GGG) airspace. I will do that! I'm always up for refueling somewhere outside DFW. Come see me at 16X sometime. I'll waive the $100 landing fee and offer free coffee (and some really poorly prepared food if you give me a heads-up). Hey Propwash airport looks pretty nice! I've riddin my bicycle past there a couple of times, but I don't fly- I give y'all vectors and safety alerts.